explores the marriage of a naive Australian girl from a farming background to an older Italian immigrant. Eliseo was the son of a career soldier in Mussolini’s forces and he became a partisan during WWII in opposition to his father’s politics, in a country torn apart by Fascism, war and changing alliances. Eliseo’s decision to trust a younger woman from a different culture was a brave one. She put her life, and that of her young daughter, into the hands of a man she barely knew, a man whose past had scarred him irrevocably. Her efforts to become accepted as an Italian wife were at times funny, often painful, but doomed to failure because of what she did not know and could never be. Vivien Achia’s memoir has something for everyone: an idyllic childhood in country Victoria; a village childhood in Abruzzo; Eliseo’s experience of WWII; two rash marriages; drugs (narcotherapy with LSD in 1968); a heartbreaking love story; cultural conflicts and parallels; Italian cooking; Italian travel; despair; divorce; strength in adversity; Rome after the death of the Pope in 2005; and a joyful family reconciliation in Italy. 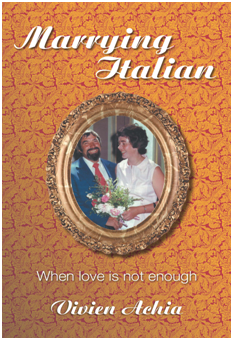 To purchase your copy of Marrying Italian - visit Readings, Booktopia, www.hybridpublishers.com.au, online, or ask your local bookstore!